The focal point in these Missoni looks is the amazing combination of textures, for sure, but the REAL story is in the skirts. Skirts with a perfectly conservative below-the-knee length. And pairing said skirts with lil' Victorian-by-way-of-the-80s lace-up boots is also very delicious. The boots are kind of a hipster standard 'round these parts, but they are just really necessary in the completion of these looks. I've been really into wearing long dresses under sweaters lately with my crazy punk-rock elf Marc shoes, so I can definitely see myself looking at this collection for inspiration in the future. I was the first one! YEEEEYYYYY!! haha mom, well, ive learned to embrace my broomsticks. Dude, this is so so good. I look really bad in that skirt length but someone else is gonna pull is off marvelously. Oooh yes! For me it means flapper inspiration! LOVE. the length kind of reminds me of the marc jacobs straw hat obi belt crazy layer collection a couple seasons back. woooaaahhh knit DREAMS. 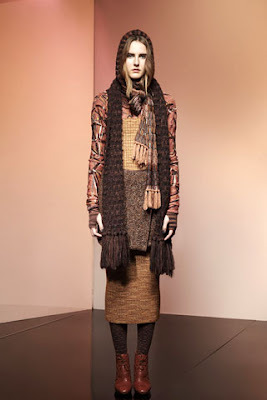 i adore what Missoni is doing with knits right now - complete revamp! not your grandpa's Irish sweater, eh?? You know when you've been wearing the same type of thing for weeks, even months, and a collection comes out and it is literally EXACTLY WHAT YOU'VE BEEN WEARING. It happened with Missoni PF (except Angela's got it down 27 times better than I do). Past the knee skirts, layering, knits, etc etc. Missoni has been top notch for some time now though, so I'm not surprised at how lovely it all is. Missoni~ish chunky knits are things that I need to own. pronto.